This was a picture I took of a Christmas gift for my youngest granddaughter. It highlights the improper use of an apostrophe. What exactly belongs to Barbie? Or are you talking about more than one Barbie? Perhaps you’re talking about 20 Barbies? 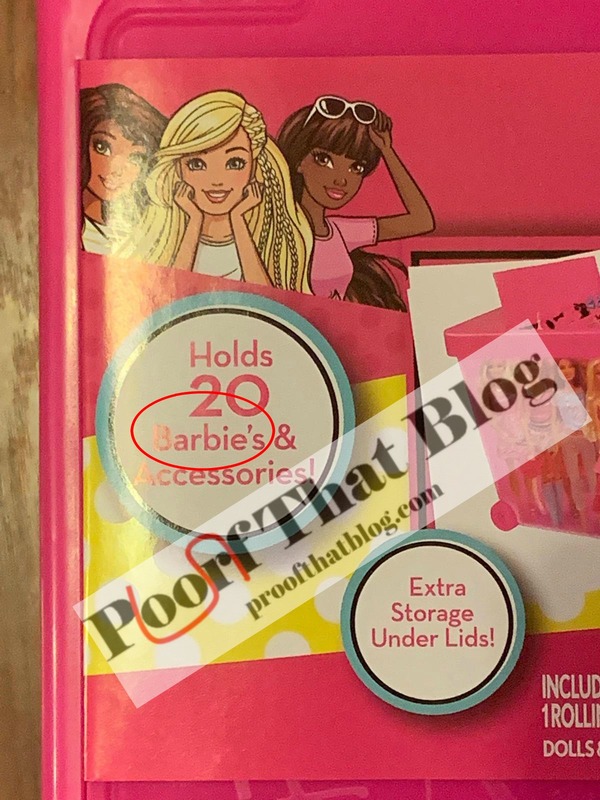 If this had said 20 Barbies and Barbie’s accessories, then the apostrophe in the second “Barbie” would be correct because you’re talking about accessories belonging to Barbie. As it is here, the apostrophe is incorrect because you’re talking about 20 Barbies so it is plural NOT possessive. ENCORE – Plurals, Possessives, and Surnames Oh My! Since some people will be sending out holiday cards and/or letters soon (if they haven’t already), I thought it was time to rerun a blog post about making last names plural and possessive. If you are sending cards out for your whole family, please pay attention to this. 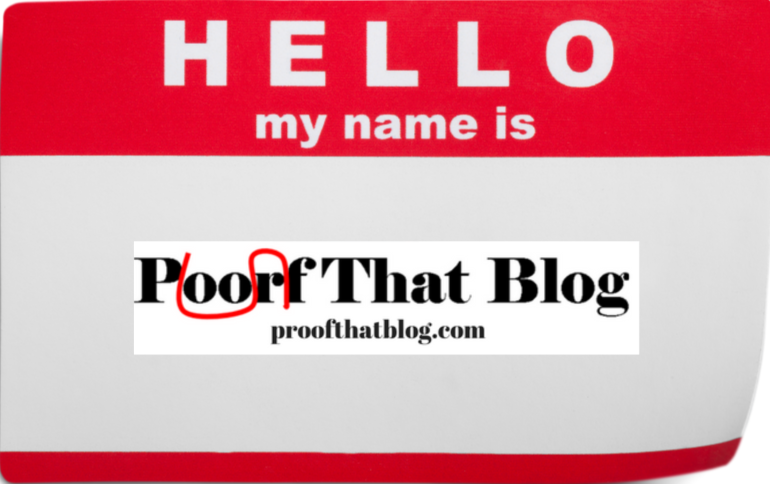 A reader asked me to address possessives with a proper name. I mentioned it in an article early on (see Apostrophail! ), but we will delve into it here. The first rule–the most important thing to remember when working with surnames (a person’s last name)–is do not change a person’s name. You can’t add an apostrophe before an “s” when the surname ends in “s.” For instance, do not make the name “Andrews” possessive by putting the apostrophe between the “w” and the “s.” That is changing the spelling of Andrews. A person’s name is the most personal thing they have. Don’t mess that up! So here are some tips for making surnames plural and possessive. The Smiths went to the Halloween party dressed as dice. That means more than one Smith went to the party. Where the surname ends in s, x, ch, sh, or z, you should add es to make the name plural. The Lopezes have been married for 50 years. However, if adding es makes the name hard to pronounce, just use the s.
Mr. Smith’s car was repossessed. For these surnames that are plural and possessive, make them plural by adding an “s” and then add an apostrophe to make them possessive. The Smiths’ car was parked illegally. Shirley Jones’s son flunked algebra. You would pronounce it “Joneses,” so you add the apostrophe and “s.” Where the surname ends in “s” and making it plural adds an extra syllable that makes it awkward to pronounce, add only the apostrophe. Mr. Andrews’ house was broken into. You would not pronounce it “Andrewses,” so you only add the apostrophe. Where you are talking about a surname that ends in “s” and you want it plural and possessive, make it plural first and then follow the rules on making it possessive. The Joneses’ house was for sale. 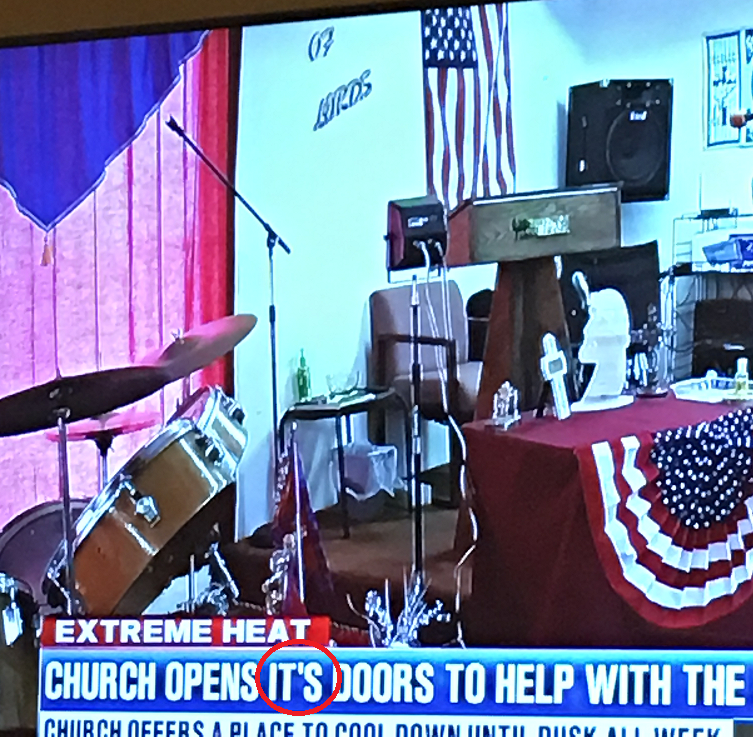 You make Jones plural by adding “es” because it ends in “s,” but adding apostrophe and “s” after that would make it difficult to pronounce (Joneseses) so you just add the apostrophe. Again, the main thing to remember is not to change the basic spelling of a person’s name. Start with their name spelled correctly, and then figure out how to make it plural and/or possessive. Hopefully this is helpful. Don’t upset a person by misspelling their name. Possessives and plurals aren’t difficult if you think about the base word you are trying to change. While everyone has probably seen this one already, my son sent this to me and I thought it was interesting. Not only is “Union” spelled wrong, requiring them to reprint all of the invitations to the State of the Union Address, but I think that the Gallery is set up for more than one Visitor, so it should be the Visitors’ Gallery. I checked the U.S. Capitol Visitor Center website to try to figure out what they call it, and I find reference to “the Visitor Galleries,” which would be correct as it is a name for that area of the Capitol, and “the House and Senate Galleries,” but I find no reference to the “Visitor’s Gallery.” I’m thinking they didn’t fix that error when they reprinted the invitations because it isn’t an obvious error–to most people. 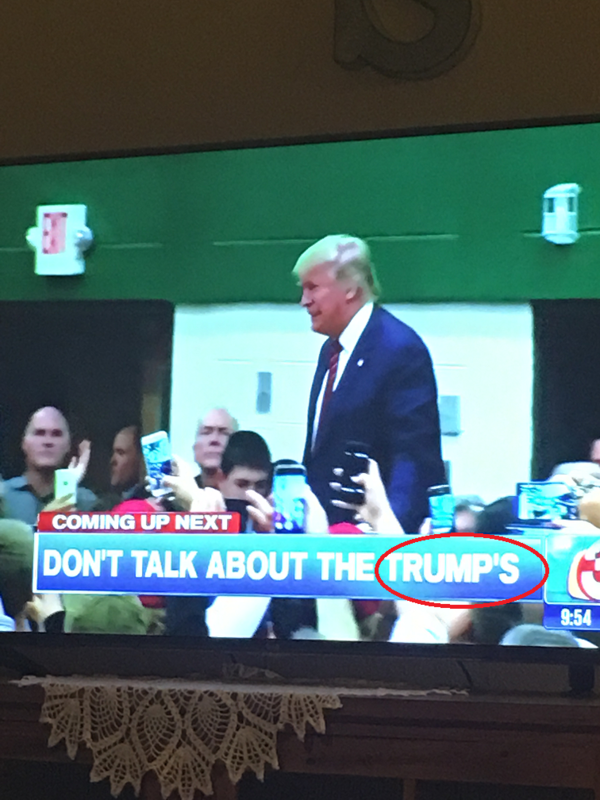 Grammar Giggle – What Do the Trumps Own? Comments Off on Grammar Giggle – What Do the Trumps Own? I realize that most companies who personalize things make you agree, and agree again, that what you have provided to them is correct. I understand that. I just wish they wouldn’t use bad examples in their catalogs. 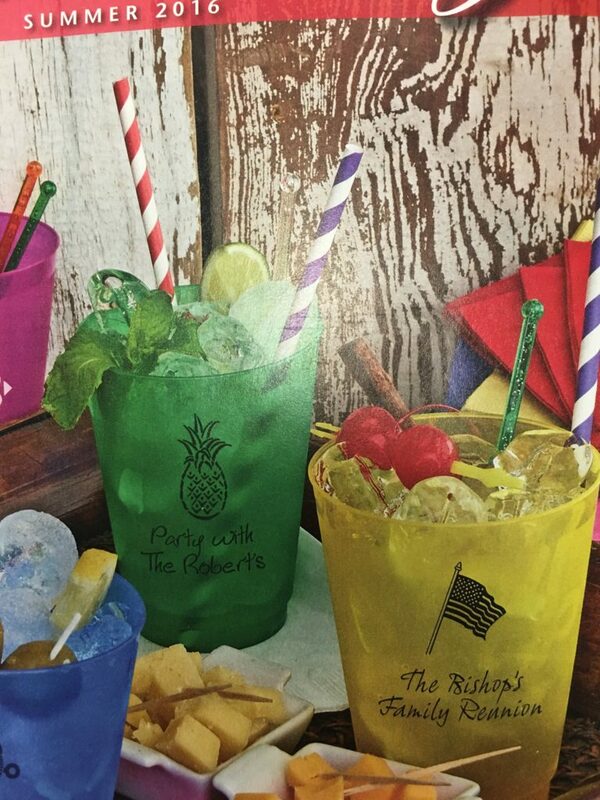 I saw these on the cover of a personalizing company’s catalog. Besides the fact that there is no apostrophe necessary because Robert doesn’t own anything related to this sentence, I’m curious about exactly why Robert feels entitled to be called “The Robert.” If it were the Roberts Family, it should say “Party With The Roberts.” In the second example, again, there should be no apostrophe because you’re talking about the “Bishop Family Reunion.” It is the reunion of the Bishop Family and the apostrophe and “s” are unnecessary. 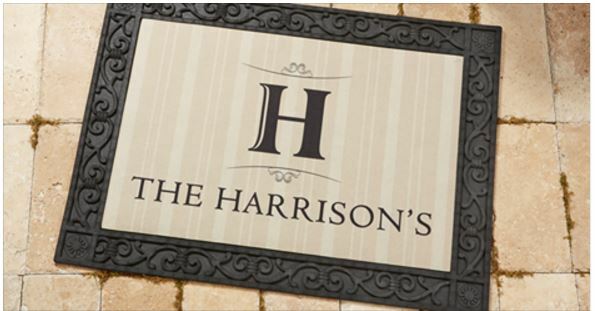 Grammar Giggle – What Belongs To The Harrisons? Comments Off on Grammar Giggle – What Belongs To The Harrisons? 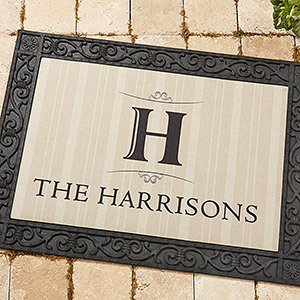 This was a Facebook ad to entice me to order a personalized welcome mat. This one is correct and renewed a little bit of my faith in the fact that someone at this retailer or the marketing company for the retailer actually knows what is correct. More discussion on this topic is at Plurals, Possessives, and Surnames Oh My! As we’re preparing for Christmas, I will share a Grammar Giggle each day. So on to Day 1! And we might as well start with an improper possessive. 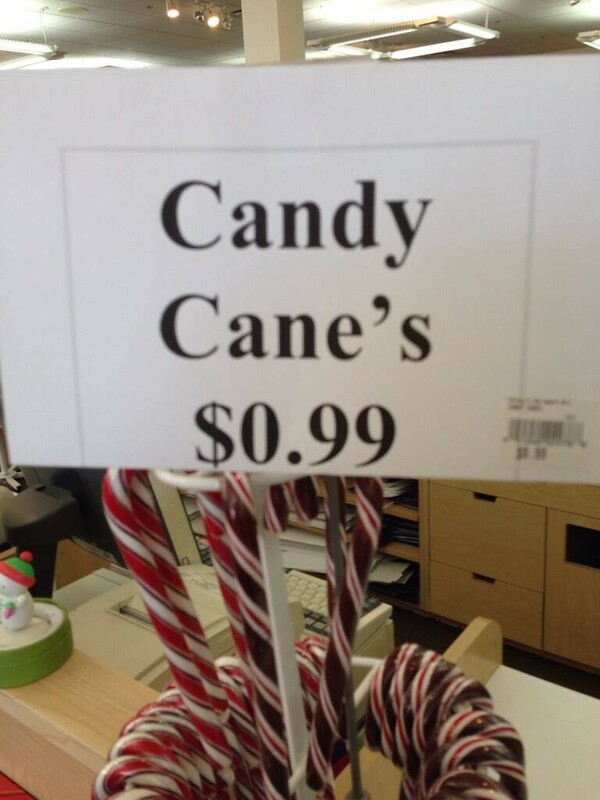 What belongs to the candy canes? NOTHING! 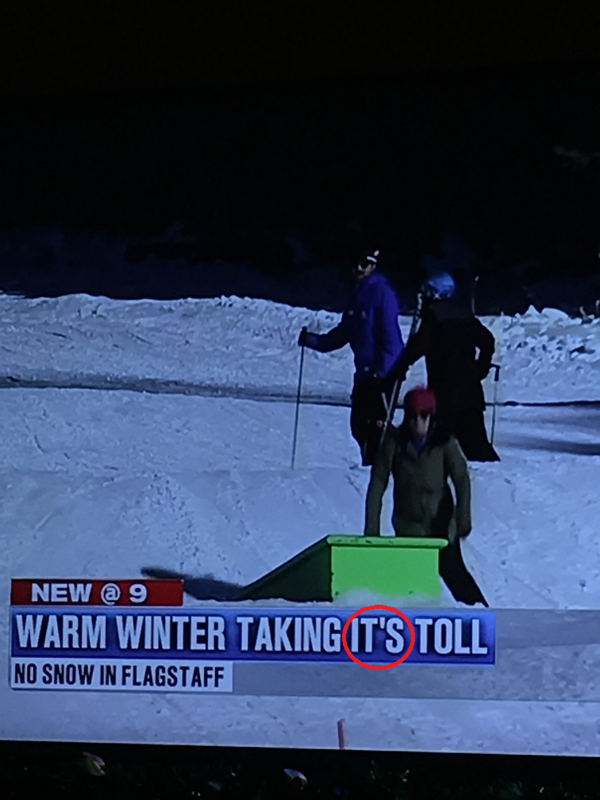 Thus, there should be no apostrophe. This was recently in my Facebook feed and caught my attention. 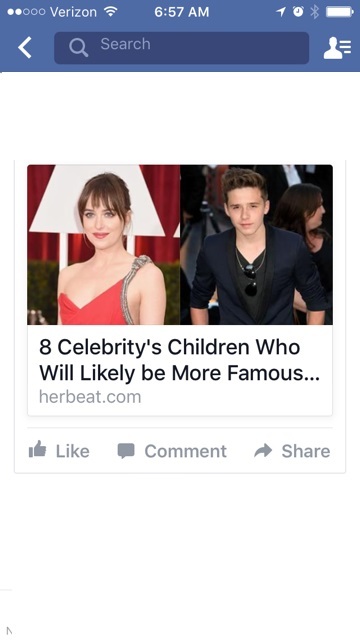 Yes, the children belong to each celebrity, but they belong to eight different celebrities so should have been “8 Celebrities’ Children . . .” to talk about the children of eight celebrities. See the formula here.